A week of wedding and family. Our lives have been full of family and festivity this last week. Kate is a married lady now! Her father walked his third and last daughter down the aisle. I haven’t yet come up with a nickname for my son-in-law, dear as he is to us already. In the last week we’ve grown to love his whole family and are brimming with thanks to God for expanding our tribe in such a rich way. The wedding itself was beautiful, for which I can take little credit, as Kate had the artistic vision and arranged most everything. The cake was baked in Washington DC and carried on an airplane to be iced near the reception venue. Oh, here is something I did: I lent my old KitchenAid mixer to the baker-bridesmaid for mixing the icing. So much of the event was a blur to me, I can’t remember the details of the three kinds of cake that were stacked up, though I did eat a yummy slice. One layer was gluten-free, I know that. Kate’s wedding gown likewise flew here, in an overhead bin on the plane with Kate, and only suffered minor crumpling. She and her fiancé arrived a few days ahead of time, and Pearl’s family came from Maryland early, too, so we all joined in some last-minute crafty and often orangey decorative tasks. Fiancé helped me pick the tomatoes I’ve been neglecting lately. His parents came into town and we started getting to know them as we applied labels to the wedding favors: bottles of a special recipe of hot sauce created by the bride and groom. Pearl’s family, plus their Uncle Dara from Ireland, are still staying with us, and for one night we had an extra four here with Soldier’s family. The house was bursting with liveliness and reunion the morning after the wedding when all the family who were in town gathered at our house for brunch, making 33 of us. Cousins and siblings who don’t see each other often were catching up and hugging a lot. It was surprising how easily all those bodies managed to fit and even find a place to sit. Every time I thought of getting something to eat, either Liam or Ivy would come and want to be picked up. Normally they are more shy even with me, but with a houseful of unfamiliar faces they seemed to need to connect with a familiar grandma from time to time. They also liked piling toys on Grandpa’s lap, and occasionally climbing up there themselves. Thank goodness my sisters and daughters and grandsons were taking care of the extreme logistics of feeding the crowd that included many large male teens and twenty-somethings, because I was drifting around dreamy and sublimely happy. All of my children and all of my grandchildren were right there! The teenage boys found a football and went to the park for a while. Maggie and Annie played with my grandma’s jewelry box and mended and organized all the old costume jewelry. And some of us had a very animated discussion in which we raised our voices a few times, about voting rights, abusive governments, principles of democracy and whether Kate and her new husband have a chance of getting elected as President and V.P. …and here is the poor girl lying on the couch after her afternoon’s trauma. She banged her foot on the fence and it grew a painful goose egg that required applications of ice and an hour’s worth of TLC. She needed to watch “The Secret of Roan Inish” to speed her recovery. The little girl in the movie is very much like our Maggie, so we like to watch it together every few years at least. Just before the wedding day, Pearl celebrated a birthday, and before that we celebrated Pat’s and Maggie’s birthdays a little late. For the children I baked another cake, if you can believe it, a layer cake that I’ll write about in a separate post. It’s been a whirlwind of fun and love, and a few of us have another whole week together before Mr. Glad and I will be left Alone Again. So I aim to make the most of every day, and maybe I’ll have things to write about here, too. For a few days I helped out the family of Soldier and Joy, as grandmas like to do when new babies are around. I mostly played with little Liam. (Scroll down fast if you can’t wait for the Liam-related pics.) We took walks around their neighborhood, in the Sacramento area where the hot summers make for some lush landscapes. In their very own back yard live two or three real orange trees, and guess what? It’s orange blossom time right now. If you’ve never smelled orange blossoms, I hope you get the chance before you die. The scent they exude must be what Adam and Eve smelled in Eden before death came into the world. Which makes me realize, on second thought, that you won’t have missed anything if you get to heaven without experiencing orange blossoms, because the Reality of the the One who made them in order to give us something of Himself will be there to delight you so much more. It’s a quiet and peaceful neighborhood I was pushing the stroller through. I met up with two ladies older than I who were right away taken with Liam. I asked them, “What is that scent in the air that is so sweet?” We knew it wasn’t orange blossoms, though mention was made of them. “The photinias are all blooming now,” said one woman, and that rang a bell with me, though farther down the street I came upon one of the photinias that grow as big as trees here, and a whiff of the flowers made me know that their scent wasn’t the only ingredient in the spring mix. Many, many big trees of all sorts are blooming in this town, and it’s like strolling through a bouquet. The Raphiolepis is no doubt in the mix of scents. I’ve never seen such giant specimens before. Liam seems amazingly studious of natural artifacts for a child of 21 months. As we walked past the landscaped yards or the occasional weedy strip, I plucked a dandelion more than once, and a red leaf, juniper needles and cones, and a poppy flower to hand to him. We smelled roses. He examined each thing as he rode, and then stashed it in the tray of his stroller. When we arrived home his mother put all of the items on a plate, and that was not the end of it. He kept looking at his treasures and carrying the plate back and forth. We did the same thing the next day, and then my back was hurting. I had ordered a compilation of Eloise Wilkin stories sight-unseen, and brought it along for Liam. He now doesn’t want to read any other book, I think partly because this one is well-suited for practicing the thumbing of the pages along their edges that children enjoy learning to do, as in a flip book — is there a word for that? It doesn’t work if the pages are too few or too thin, and certainly not with most books aimed at toddlers. After sitting on my lap and getting acquainted with the book in this cursory way, we found pictures that bore resemblance to things in his world. Of course that is common in books for small children, but I suppose I started a new way of making connections for Liam when, as we were looking at a picture of a bumblebee and I was making the “buzz” sound, I said, “There must be bees around your orange trees right now — let’s go find out,” and we dropped the book right there to go see the real thing. There were bees, but almost too high to see, and they were at the height of their midday frenzy right then, but L. paid close attention. That afternoon when we were playing with sidewalk chalk and water out on the patio that they shade, he suddenly looked up in the trees as though listening for the bees, and then he ran into the house to fetch the book and came out to stand underneath holding it with both hands very solemnly as he gazed up for a minute. This sort of thing happened with several more connections, such as his riding toy, a bright plastic contraption with lights flashing that didn’t much resemble the humble wooden kiddie car of yesteryear featured in the book. But he saw enough likeness to believe us, and began to want to bring his toy from across the room to sit next to the couch where we were reading. The most fun link was with the tree swing. Wilkin’s illustration in one story shows a swing that is nearly identical to the one in Liam’s magnolia tree, and he must have the book out there on the grass when I pushed him in it. I opened it to the page with the picture he wanted, and set it against the trunk where he could see it while he swung up and back and I recited “How Do You Like to Go Up in a Swing?” which poem, by the way, is also in that book. He laughed and pointed to the picture and I hoped I wouldn’t have to swing him as long as that child was swinging. Lying in bed my last morning there, I was blessed by the songs of scores of enthusiastic birds, and the smell of orange tree flowers coming through the screen. I had been able to leave it open all night as the season is now so warm and mild. Through the glass door I could watch those orange trees take shape in the dawn. Now I am home, where it’s mild, but not warm. I wouldn’t mind going back to Flowery Town soon. Next time I do, sometime after Pascha, I’ll give you a little report on Liam’s baby brother, or at least a nickname for the little guy. He’s very dear! The weather is cool, I mean. And this week it’s been cloudy as well, which is nice for taking pictures of flowers. When Kim posted a picture of an unusual coneflower on her blog I was so taken with it, if I were more the sort of person who acts quickly I’d have run over to Lowe’s in hopes of getting one of my own. But I’m not. 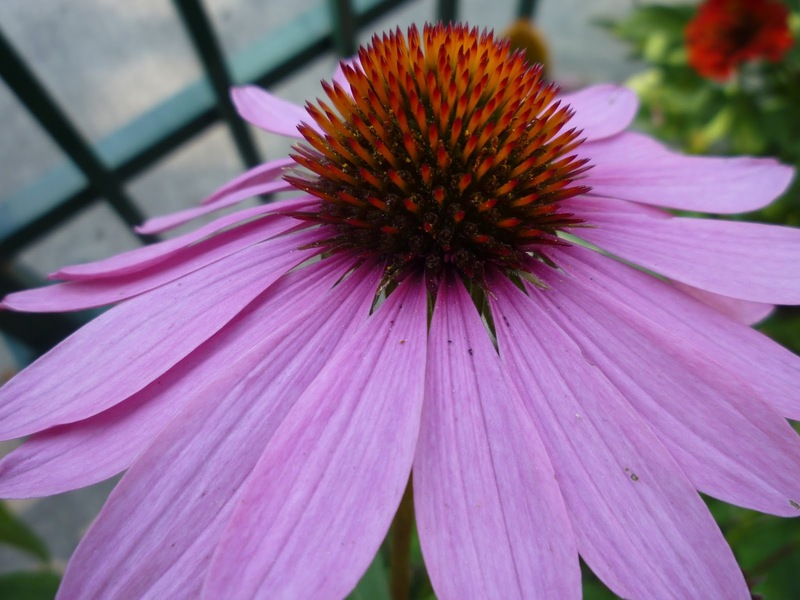 My style of impulsiveness sent me out back with my camera to study my own basic purple coneflower. of different sorts of coneflowers. August is full of special feast days in my parish, and we are also getting ready for our big food fair that happens in September. 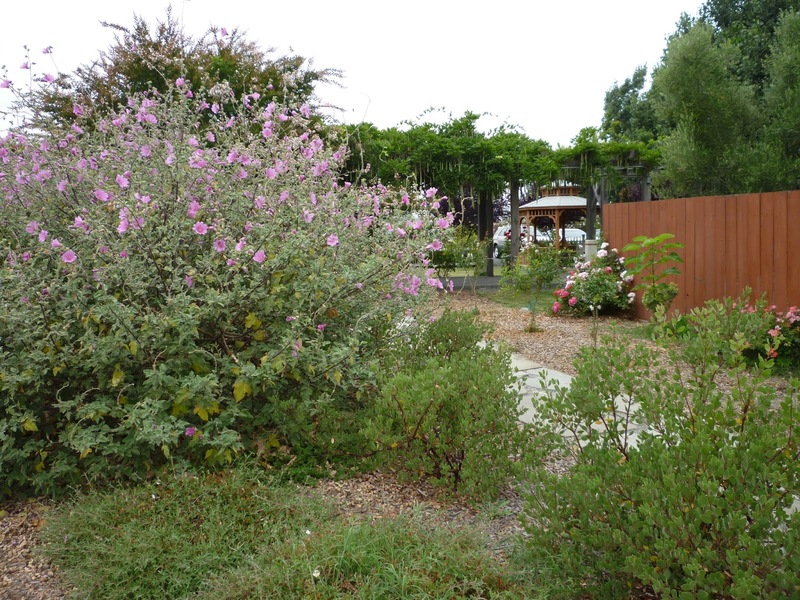 On one overcast day I took a picture of the rose mallow and manzanita at church. 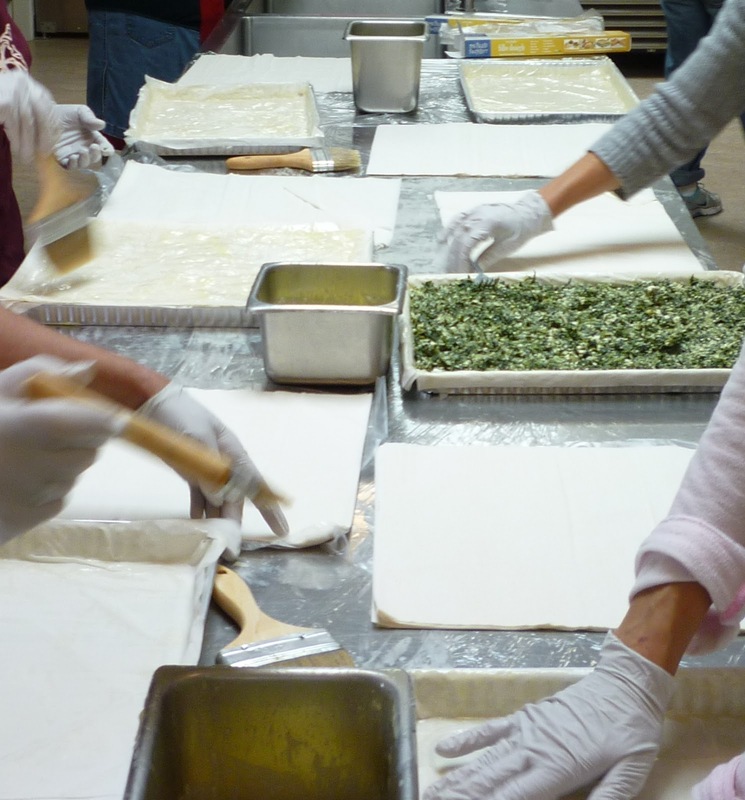 And another day I snapped this one, of a crew of us making 40+ pans of spanakopita to put in the freezer. Those are tins of butter, stacks of filo dough, and a spinach-cheese filling on our table. We will defrost the pastries the weekend of the festival and bake them to sell hot in the Greek booth. 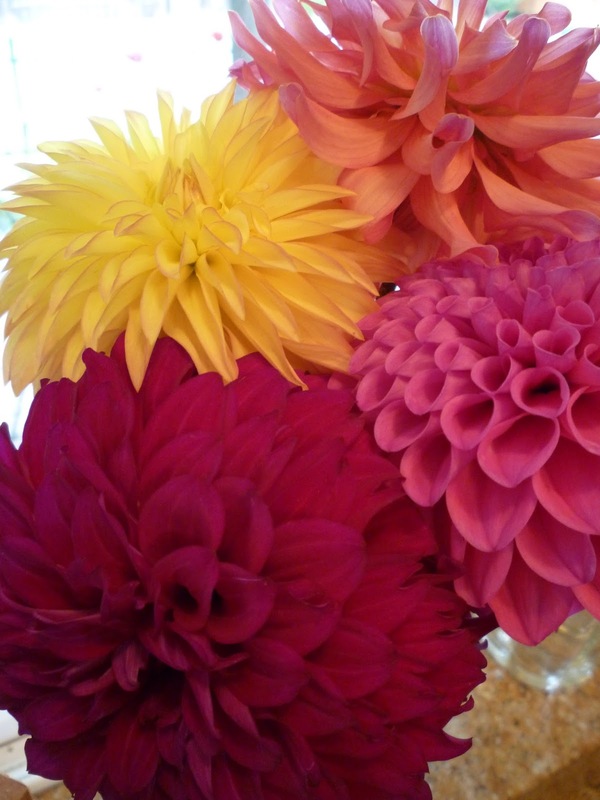 My loving man stopped on the way home from the dentist at a dahlia farm, and brought me this custom collection of big ones. Nice warm colors to make me remember it’s summertime. 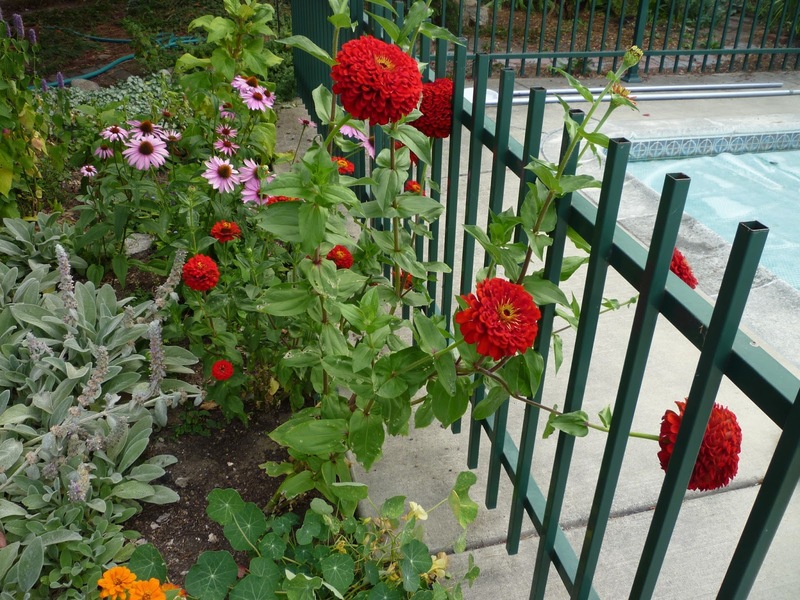 And at home my one red zinnia is climbing past three feet tall, twice as high as its neighbor. I bought two plants that were supposed to be the same, but they obviously are not. I’m glad I haven’t had only the garden variety of pretties this summer. I’ll close this random photo report with one of the sweetest flowers in my life when she was at our house, dear little Ivy. The sun came out this afternoon, and I expect to see more of it next month, and feel heat. Then I’ll be posting some tomato pictures, too! But I hope I won’t have to wait quite that long. 1 – The extra warm temperatures that stayed up into the nighttime followed closely upon a late rain. This sort of tropical weather caused the basil (and everything, really) to grow lush early in the season, and that meant I could — I had to — make a huge batch of pesto. Pippin was here to be my recipe consultant and we decided to try adding some lemon juice to my recipe. My friend told me that she does that as a bit of preservative, and the kind of pesto they sell at Costco has a lemony flavor which some people prefer. 2 – It was convenient to have extra people around to help us eat the large quantity of green beans we slathered with the fresh pesto. Yum! 3 – Ivy and I could enjoy a long session with the lavender in the evening and we didn’t have to go back inside for our sweaters. 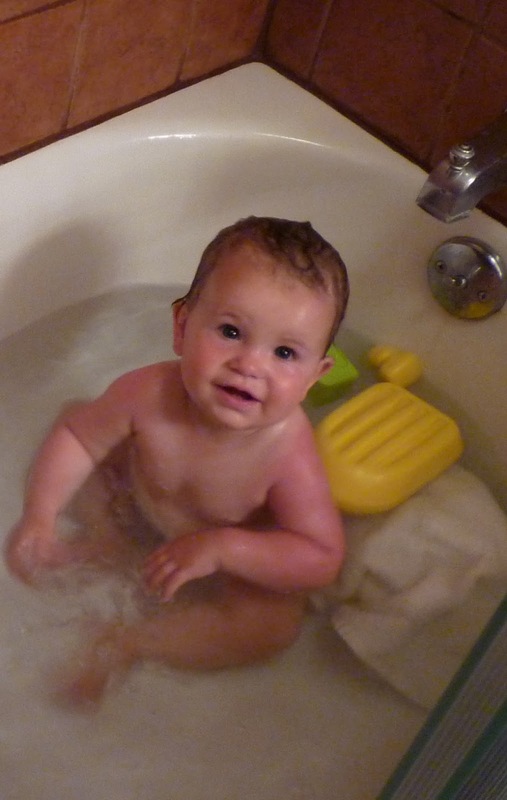 4 – Water play all day long! In the past I’ve seen others of our grandkids engrossed in washing play dishes while their teeth were chattering, it was so chilly. Ivy and Scout could be comfortable and wet at the same time. 5 – The pool warmed up and was fun to play in for hours. People could swim until the sun went down and not have to watch the fog come in. 6 – But I think my most favoritest thing has to do with the fact that I love to hang laundry in the sun to dry, and sheets are the easiest things to do that with, because they are so big, it doesn’t take long to get them up on the line and down. This summer I’ve had lots of sheets to wash already, and I have four times had the supremely satisfying feeling of using the free sunshine and afterward folding up the warm and sweetest smelling bed linens. I should write letters to the dear people who slept here and thank them for this. If we keep living here I might never experience this concurrence of heat and guests again, and this will go down in Glad history as The Summer of the Complementarity of Heat and Hospitality.